Heat oil (or ghee) in a large skillet. Fry the cashews, drain and keep aside. Then add the mustard seeds and urad dal. Fry till the seeds crackle and the urad dal turns light golden. Then add the rava/semolina and roast for a couple of minutes on medium heat, stirring all the while. Remove this to a mixing bowl and cool slightly. Then add the fried cashews, ginger, green chili, curry leaves, cilantro and carrots. Sir to combine, add yogurt, mix well till it the mixture is uniformly moistened. Add a little water to make a smooth, but thick batter. The batter should be thicker than a regular pancake or dosa batter. Cover the bowl and rest for half an hour. After half an hour, add salt and baking soda to the batter and mix well. Adjust with a bit of water if batter seems to have thickened further. Meanwhile, heat water in a steamer vessel. Grease and set aside the idli plates. Pour batter in the idli plates and steam in the steamer vessel for 8-10 minutes or till idlis are cooked (check with a toothpick to see if it comes clean). Remove from steamer, rest for 5 minutes and remove the idlis from the idli plates using a spoon. 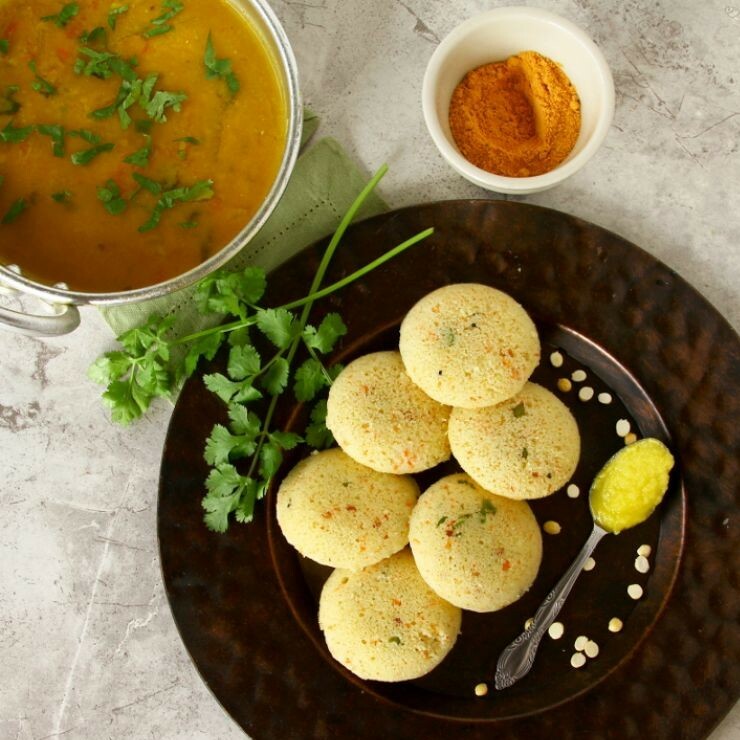 Serve idlis immediately with hot sambar and spicy chutney powder. Store leftovers in a hot-pot or casserole. These can be re-heated in the microwave or lightly steamed again.